Here comes the bride! If you’re the maid of honor or another close friend to the bride, it’s your duty to plan a memorable bridal shower. 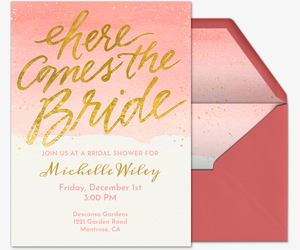 Make it easy on yourself by starting with free or Premium invitations from Evite. 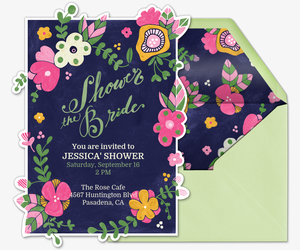 Whether you’re planning a spa day, brunch, tea party or garden party, set the tone with one of our dozens of casual and fancy bridal shower designs. Planning a bachelorette party instead? Check out our Bachelorette Party invitations. 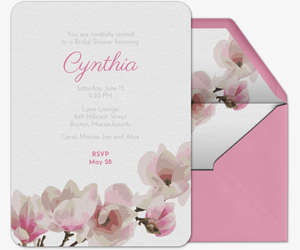 Paperless invitations keep all your plans organized and in one place. Track RSVPs, manage your guest list, share photos, and post comments all from one event page, or on the go using our mobile app. Plus, easily include a link to the couple’s gift registry, located under “Gifting Options,” thanks to Evite’s partnership with The Knot. 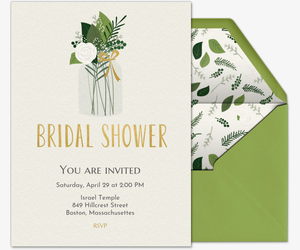 You can also personalize one of our upload-your-own invitation templates with a photo of the lovely bride-to-be, or upload an entire design of your own to one of our Premium design-your-own invitation templates. 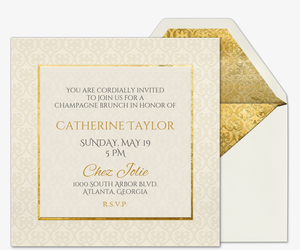 Make the guest of honor feel extra special by sending out Premium invitations. Evite Premium is our advertisement-free option. 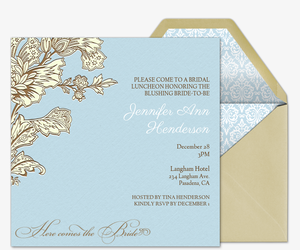 Invitations come with matching envelopes, stamps, and optional inserts, such as photo and text cards. Pricing is based on the size of your guest list. Get ideas for bridal showers and more wedding-related events at ideas.evite.com. Find inspiration on DIYs and see photos from bridal events hosted by users just like you, from tea parties to brunches. 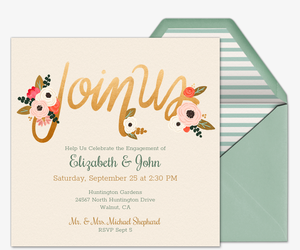 Weave the wedding events together by planning them all with Evite. 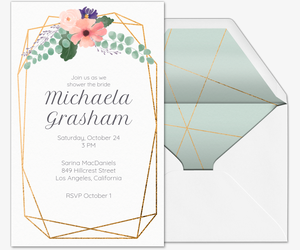 Browse our bachelorette party invitations, bachelor party invitations, engagement party invitations, rehearsal dinner invitations, reception invitations, wedding invitations, and save the date cards. Plan the rest of your milestones with Evite, too, from birthday parties to baby showers.